All of our paddle sessions and events are governed by accptable and safe state of the water and reasonable weather. Do make contact with other paddlers before turning up at our launch site in case the general consensus is not to paddle at all due to adverse conditions. These are general paddle evenings. 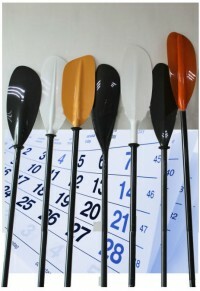 Tuesdays can be relaxed and recreational or demanding and energetic, as paddlers prefer. We collect the kayaks from the lock-up at the car park and then launch from Benarth Slipway. These paddle sessions are for all members and are suitable for all levels, subject to weather conditions. New paddlers will be invited to a designated 'Introductory Evening' when there will be plenty of experienced paddlers on hand to supervise. Novice paddlers will be chaperoned by a more experienced paddler, until the club deems them competent to be an individual paddler. Do make sure you know who your supervising paddler will be before you get into a boat. Are now the regular spot for experienced paddlers who do not need supervision and may want an additional session. Our timetrials are a great way of keeping fit, measuring your personal stamina and tracking improvement in your own performance. More detail below. For 2016 we have been able to add fortnightly Conwy paddles to our schedule. Please contact the club to check which weeks they are happening. Special trips are arranged occasionally, and advertised to all members. We are also open to requests about where we should go. In the summer on a calm day, we might find ourselves on a beach to play in mild surf, or a trip to the nearby lakes of Padarn, Gwynant (small charge for parking) , or Geirionydd. We are able to arrange trips on the Canal at Llangollen, as our affiliated membership to Canw Cymru (Canoe Wales) entitles us to paddle on many (but not all) canals. Llangollen is a relaxing and scenic paddle and an ideal introduction to either marathon or Touring. You can expect to encounter other boats and barges also moving on the canal. In summer there are charming horse-drawn pleasure barges also to be seen on the llangollen Canal. Please familiarise yourself with the canals Code before going. Races at neighbouring clubs tend to be held on sundays. DCP also do occasional sunday events to suit those who may be working on saturdays. Every friday evening during the summer, starting when the clocks change in March, Dyffryn Conwy Paddlers run a canoeing time trial through the harbour at Conwy. The course is approximately 3km per lap, and goes from Benarth slipway where the club normally launch. We head downstream, under the 3 bridges and out through the harbour to the Conwy Sailing Club Marina entrance and back to Benarth slipway again. The strength and direction of the tide can make a slight difference to the times. Part of teh challenge is picking the fastest water and knowing when to hug the bank. THE TIME-TRIAL: Is raced on a handicap system with a paddlers handicap being based on their best time for the year so far. A newcomer to racing is usually given a handicap of 0, and that means that they are expected to complete the 2 lap course in 50 minutes. More experienced paddlers then start a set time behind based on their handicap. This means that all paddlers finish together (in theory). This also builds in a safety factor, as less experienced paddlers will have the faster paddlers following up behind them. As a rough guide, a UK international standard paddler would take just under 30 minutes on this course, with most club paddlers taking between 32 and 45 minutes. The time trial race is two laps. However, paddlers that do not want to race for 50 minutes can always choose to race over one lap until they feel confident to race the full course.